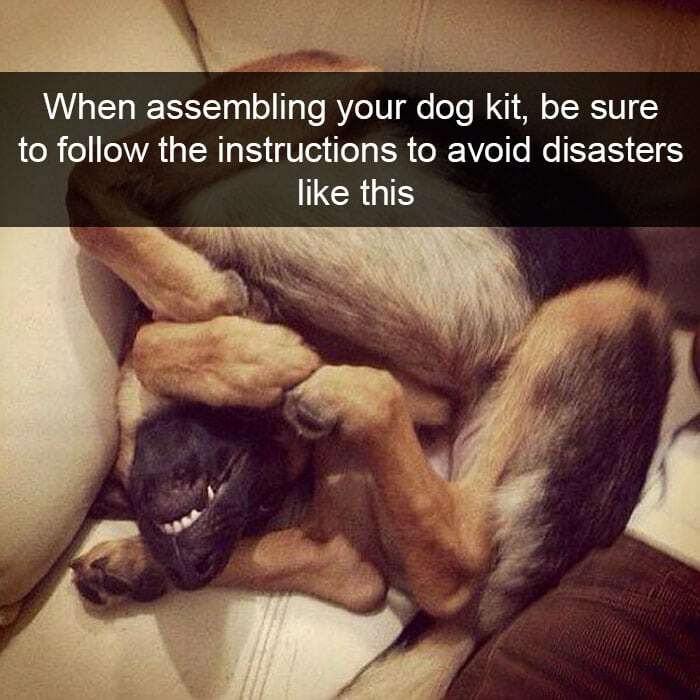 Dogs are quirky creatures who often do unintentionally hilarious things. When their dog does something funny, many people will reach for their phone and take a photo. And one of the best ways to share these cute photos is Snapchat. Snapchat is just one of many apps that people use to take and send photos to their friends – but in our experience, people are able to add the funniest captions to Snapchat photos. 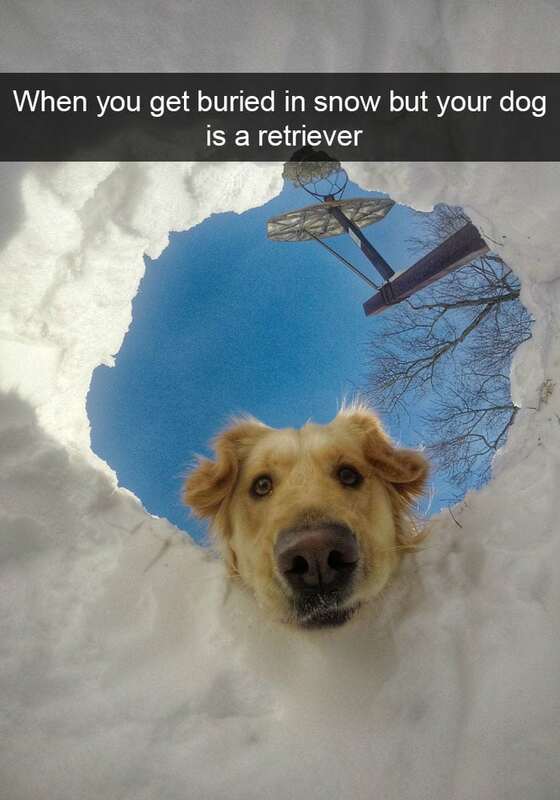 Snapchat is full of hilarious photos featuring man’s best friend. Sometimes, owners will add captions to the photos, and other times, the photos simply speak for themselves! But there’s one thing all these photos have in common: they’re all guaranteed to make you smile. If you are a dog lover (even if you aren’t), these perfect photos will put a smile on your face or even make you laugh. Dogs have a unique ability to touch our hearts in ways that no one else can. They’re man’s best friend for good reason! We’ve gathered some of the most hilarious dog Snapchats featuring some heart-meltingly adorable pups. 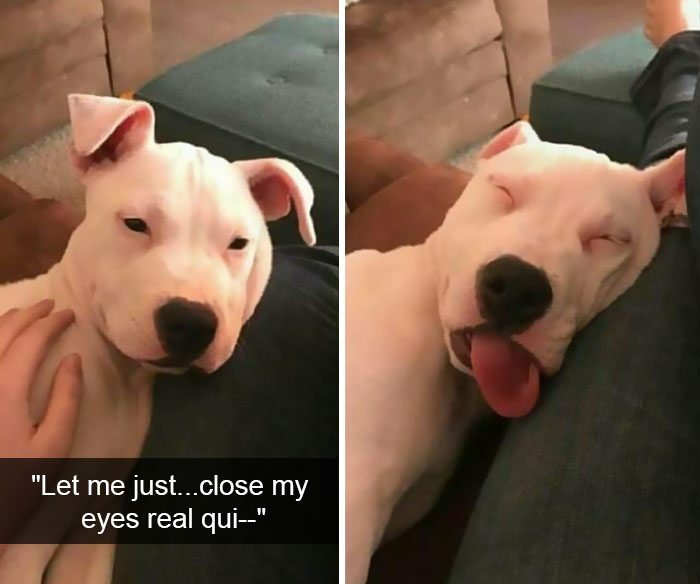 We scoured the Internet – it turns out there is no shortage of adorable and hilarious dog Snapchats on the web – and have put together a list of 35+ of the funniest and most adorable photos that we could find. We really spent a lot of time finding the best photos, so we’re excited to share them with you today. We personally found that the caption on #32, which refers to how the owner’s dog looks at pizza, is funny and relatable. We also really liked #33. As you’re looking through these Snapchats, let us know which of the photos is your favorite in the comment section. It’s okay if you have multiple favorites, so do we! If you’re in need of a good laugh today, check out these great Snapchats! We have to say, some of these captions are really clever. Which of these Snapchats is your favorite? 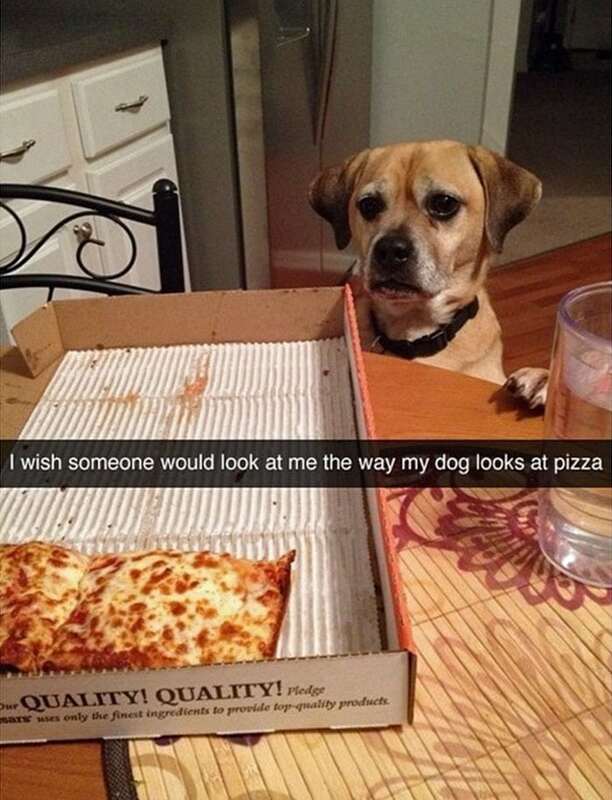 Enjoy these 35+ hilarious dog Snapchats that are impossible not to laugh at! 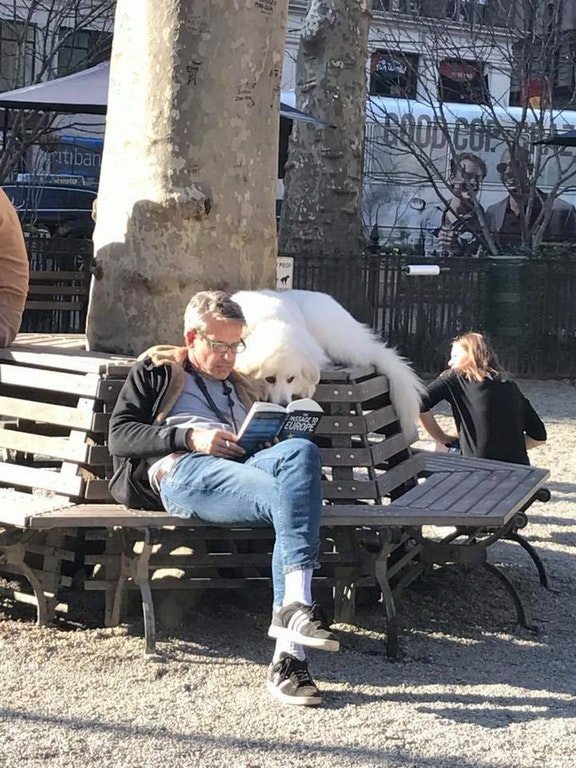 When this Great Pyrenees and his human go to the dog park, the pup likes to spend his time reading. That’s why his white fur is so clean—since he’s spending his time reading, he never gets dirty! This pup has found her true soulmate, and it’s a piece of pizza. We hope this dog’s owner gave her a bite—she deserves it for being so loyal and such a good girl. 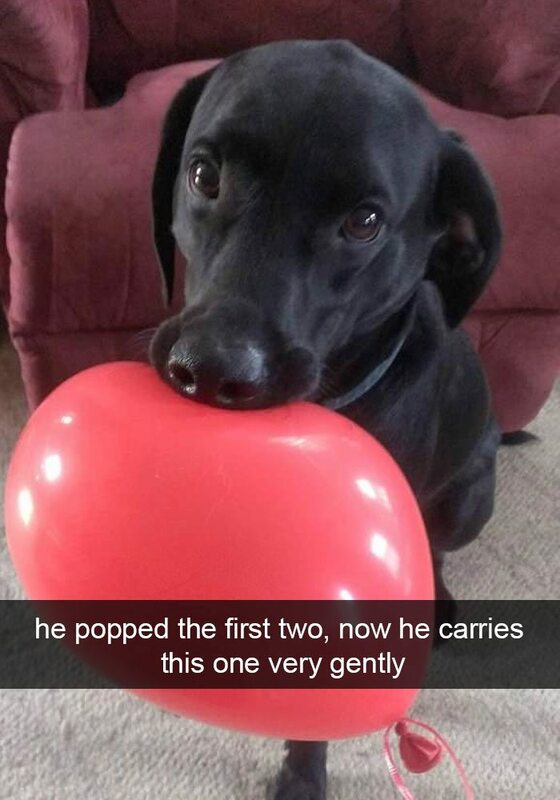 This pup discovered that he loved balloons, but he didn’t like the sound they made when they popped. He realized that he had to hold the balloon gently without touching it with his teeth. What a faster learner! 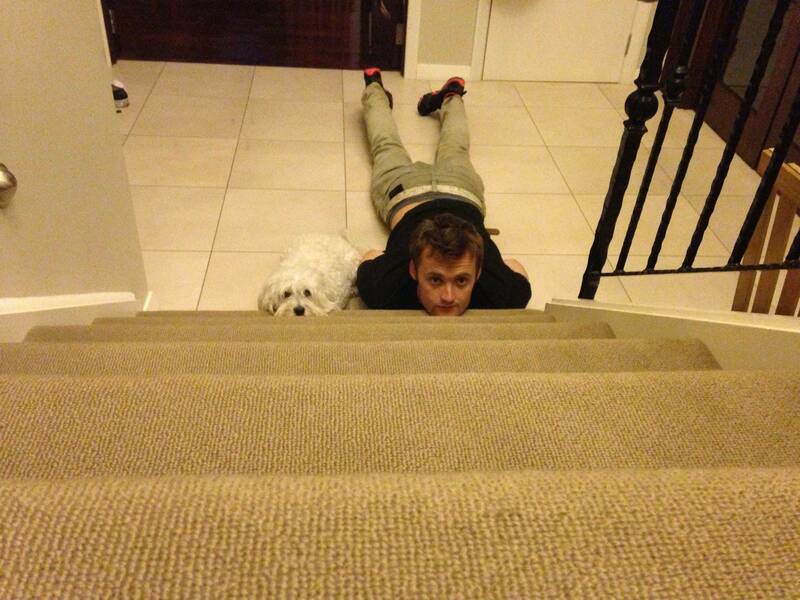 This dog isn’t sure why his dad is lying down with his chin on the stairs, but since he’s such a good, loyal dog, he decided to join him. Now, the two love hanging out on the stairs together—they’re able to see who’s coming and going in the house. 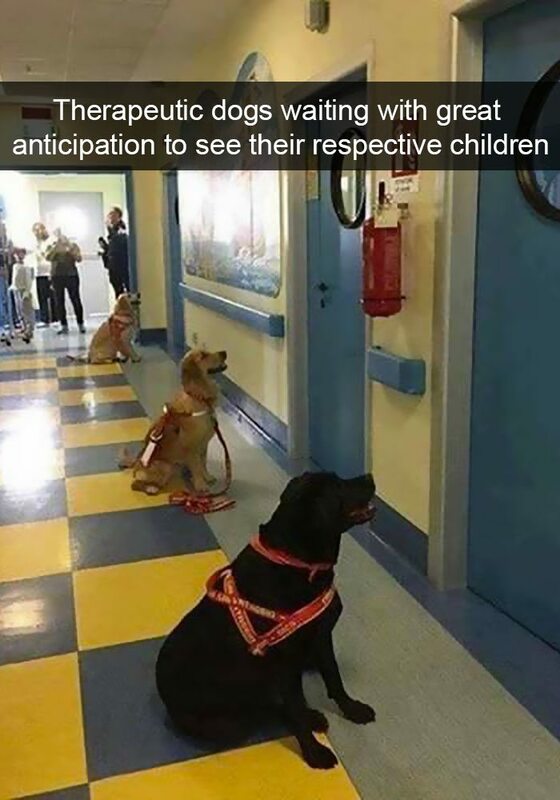 These good boys and girls can’t wait to greet their patients for the day. The pups love spending time with people in need, and they’re excited to get started. Dogs really are the best! Pups have to be in a bag when they’re commuting on the NYC Subway, but this dog doesn’t seem to mind that rule! 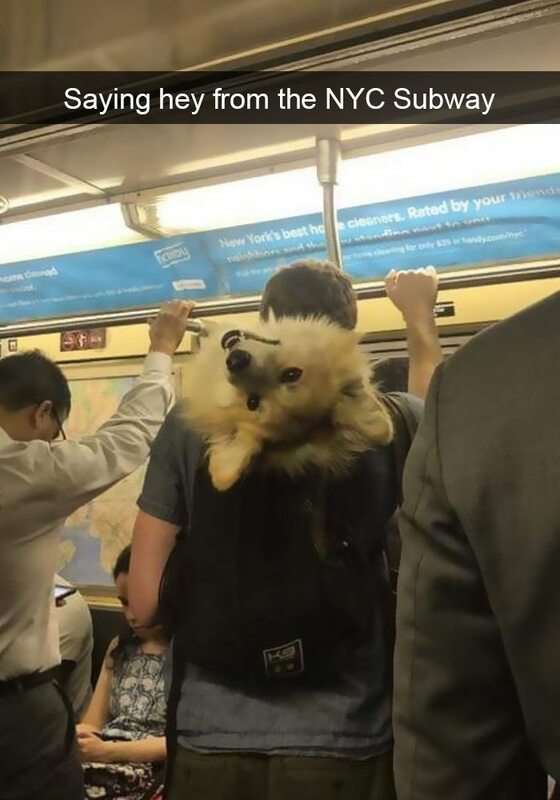 This adorable puppo loves chilling in his owner’s backpack, and he also enjoys saying hi to everyone else on the subway. We’re sure this dog’s cute greeting made everybody on the subway smile! 7) What Big Ears You Have! 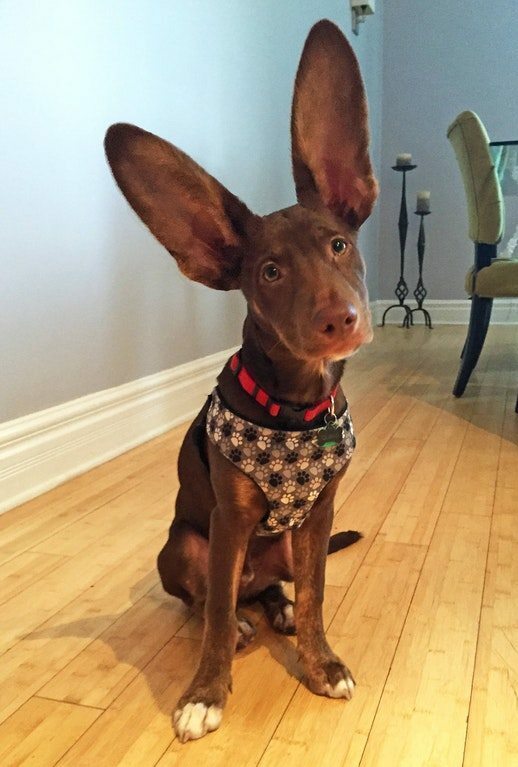 This bat-dog has some of the most incredible ears we’ve ever seen! This puppy must be able to hear everything in a ten-mile radius. But most importantly, he can always hear when his human is filling up his bowl or pulling a treat out of a bag. Dogs and seals share a lot of similar characteristics—they both bark and love doing tricks! 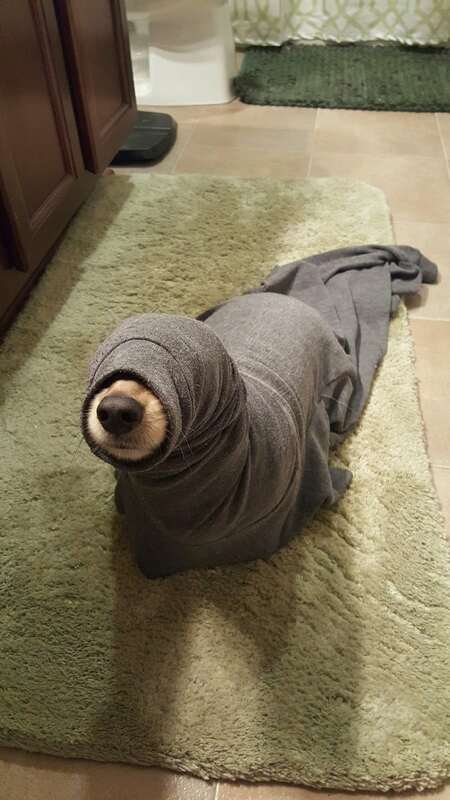 This dog is even more similar to seals than most other pups. Hopefully, this good boy will transform back into a dog soon. 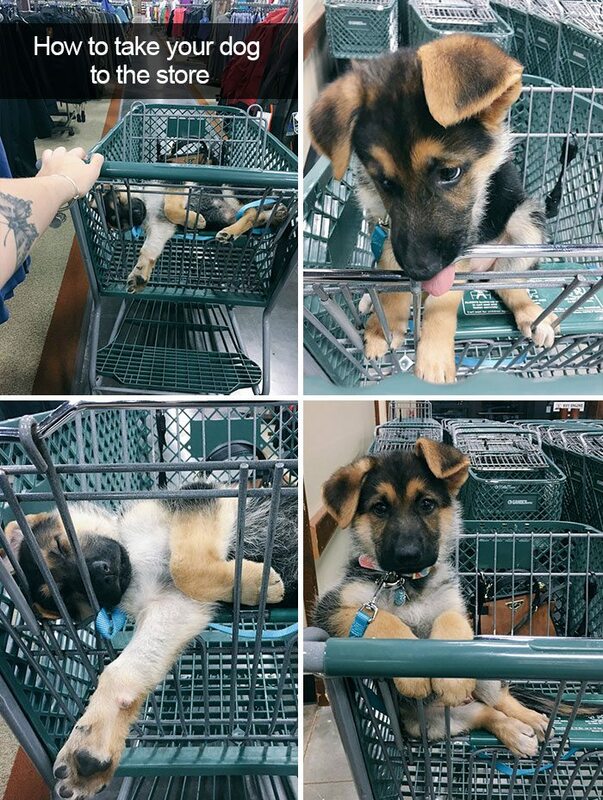 This puppy shopped until she dropped! We’re not sure if we would be able to focus on shopping with such an adorable little assistant. We hope the pup helped her mom pick out some cute outfits. It’s always tough to give a dog a pill—even if you cover it with peanut butter or food, they always seem to realize it’s there. 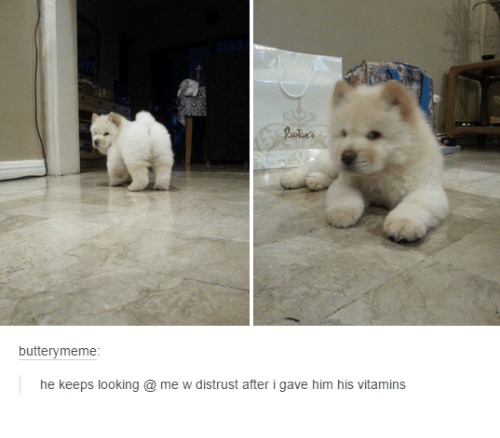 This owner was able to trick their puppy into eating his vitamins, but now, the puppy isn’t sure if he can trust his human anymore. After the puppy’s owner gives him a few vitamin-free treats, we’re sure he’ll learn to trust his owner again! 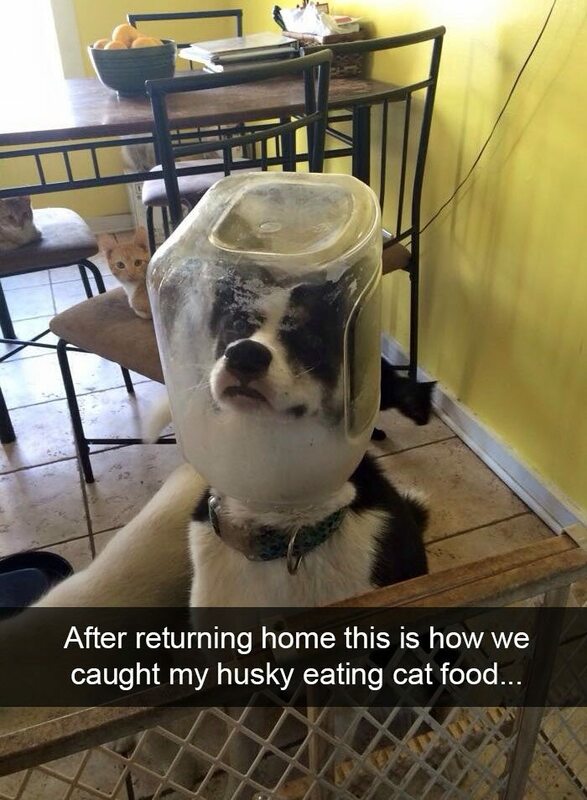 We’re not sure what’s funnier about this photo: the dog getting caught red-handed or the cat’s hilarious expression! We’re sure the dog tried to convince his owner that this was all the cat’s fault. The dog’s owner will probably keep the cat food on a higher shelf from now on! Everyone’s experienced that moment where you start assembling something and realize that you misread a direction along the way. When that happens, you may end up with a chair leg in the wrong place or a missing shelf. This Snapchat imagines that scenario happening with a dog—and the results are hilarious! In this photo, there are two puppies for the price of one! 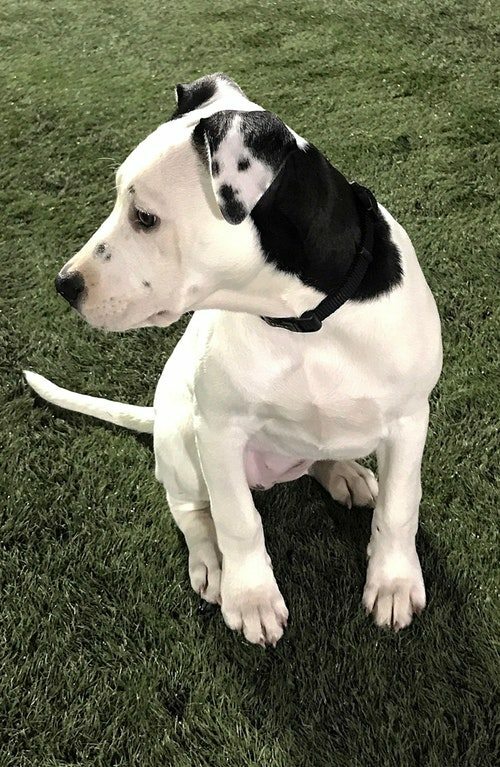 If you’re having trouble seeing the second puppy, take a look at the dog’s ear. This is one truly unique puppo! Amos’ owner told him to sit, and being a good boy, he immediately sat down where he was. But we’re sure Amos’ brother wishes Amos took their owner’s directions a little less literally. After all, having your brother sit on your face isn’t too comfortable. When the photographer told these dogs to jump up, three listened, but one didn’t quite understand what he meant. 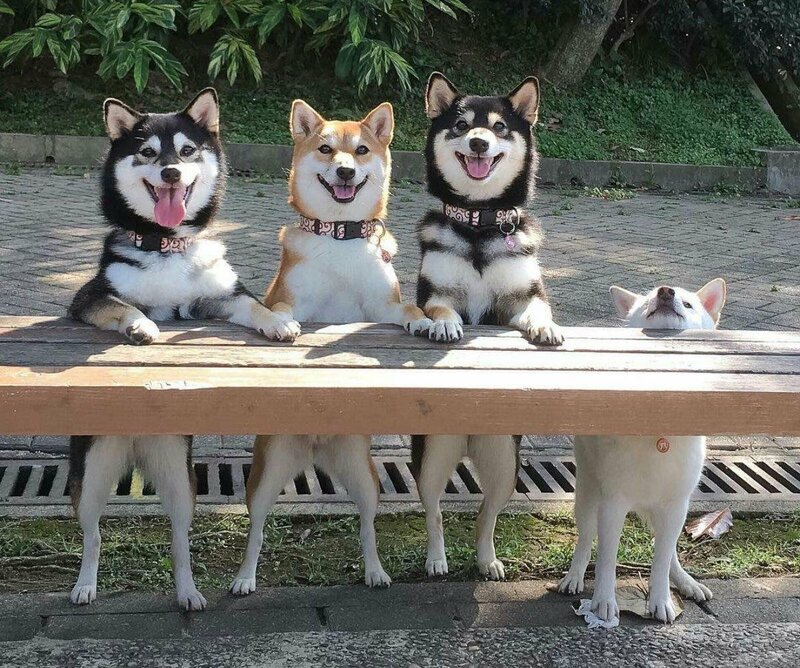 Still, the pup tried his best, and he placed his head on the bench. We think he deserves an ‘A’ for effort! Even the best thief gets caught sometimes, and that’s just what happened with this pup. 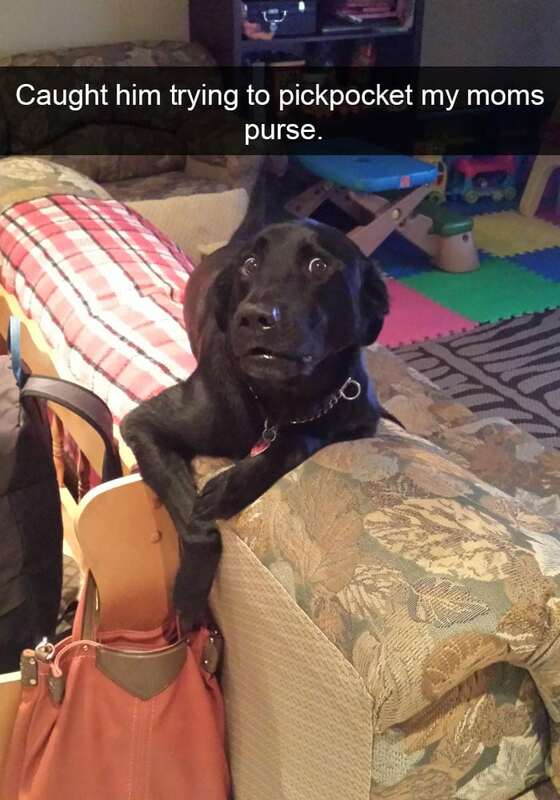 He just wanted to see if his mom had any treats in her purse, but his human sibling caught him in the act. Hopefully, this is the end of this pup’s life of crime. 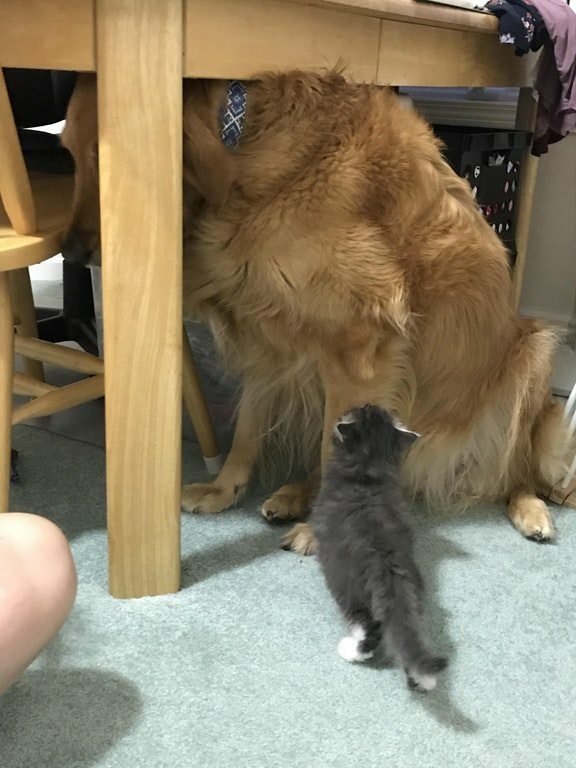 This dog is 85 pounds, but he’s terrified of this little 15 pound foster kitten. We hope the kitten reassures her big friend and tells him there’s nothing to be afraid of. Hopefully, this sweet boy will warm up to the kitten eventually. You may think dogs don’t remember the promises you make them, but as this Husky shows, that’s simply not true. 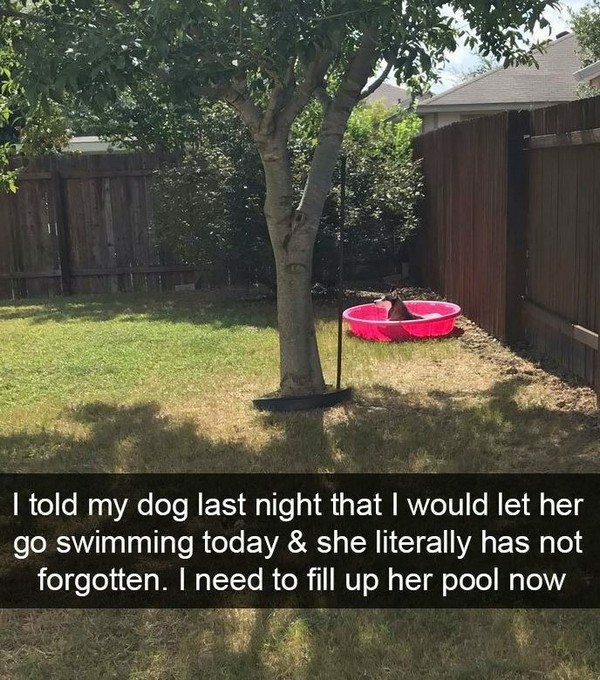 This Husky’s mom promised her she could go swimming, and she refused to leave the pool until it was filled with cool, refreshing water. We’re proud of this Husky for standing up for what she wants! 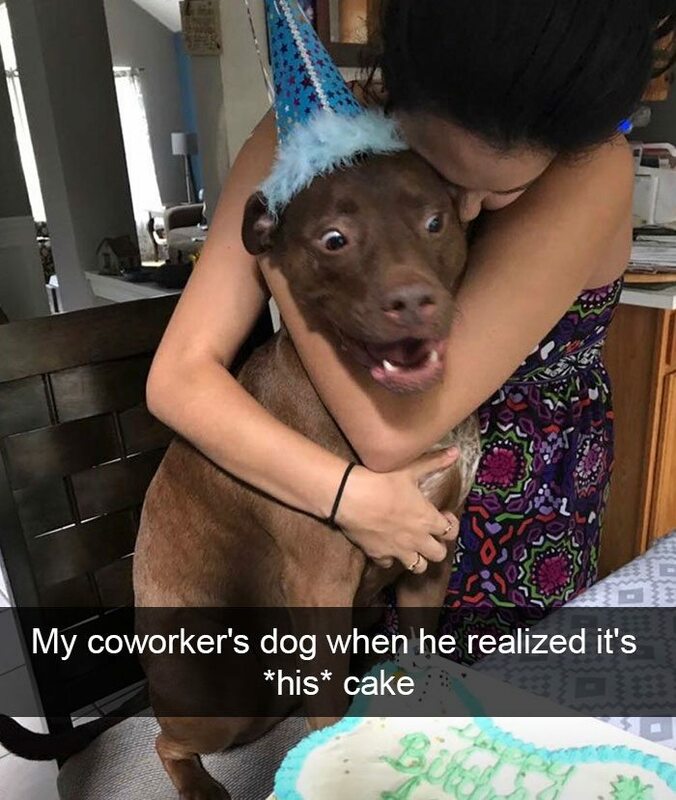 We love the shocked and excited expression on this dog’s face! He can’t believe he gets his own birthday cake, and he can’t wait to dig into it. We hope this sweet boy enjoys his special day! This dog has had a tough day barking at people walking by his house, chasing squirrels, and playing with his human. He wasn’t planning on taking a nap, but he was just so exhausted. Plus, his owner’s leg is the perfect pillow! When this dog saw his owner climbing into a hole in the snow, he was very concerned. He wanted to make sure his owner was okay, and so he ran over and looked inside. The resulting photo is completely adorable. This sweet photo shows how much this dog loves his owner. 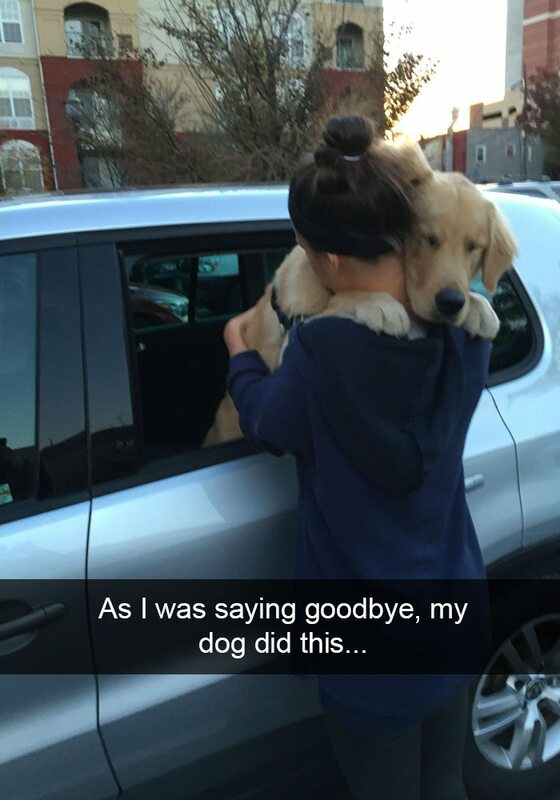 He had to give her a great big hug before she left for college. He wanted to make sure she knew how much he’d miss her while she was gone! Techinically, this dog isn’t breaking any rules since he’s just sitting, not swimming. 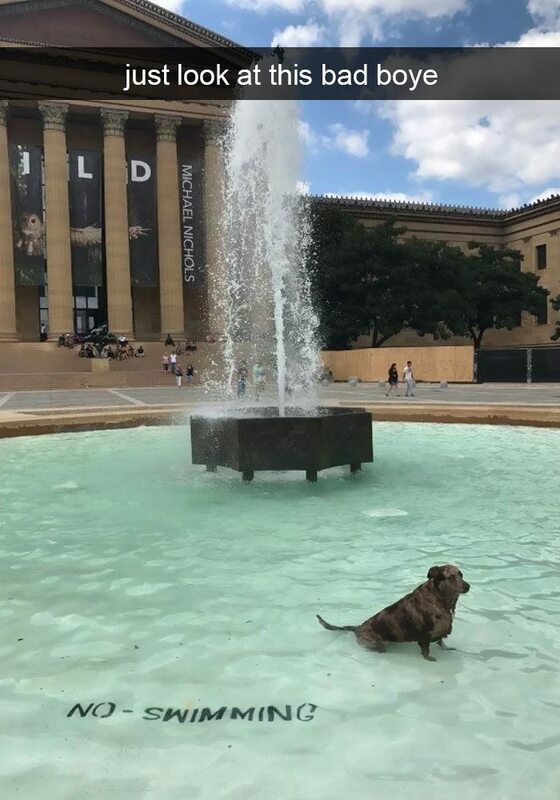 Still, we’re not sure if that argument will hold up in court, so the pup might want to leave the water if he sees any security guards coming. All three of these Corgis are absolutely adorable. 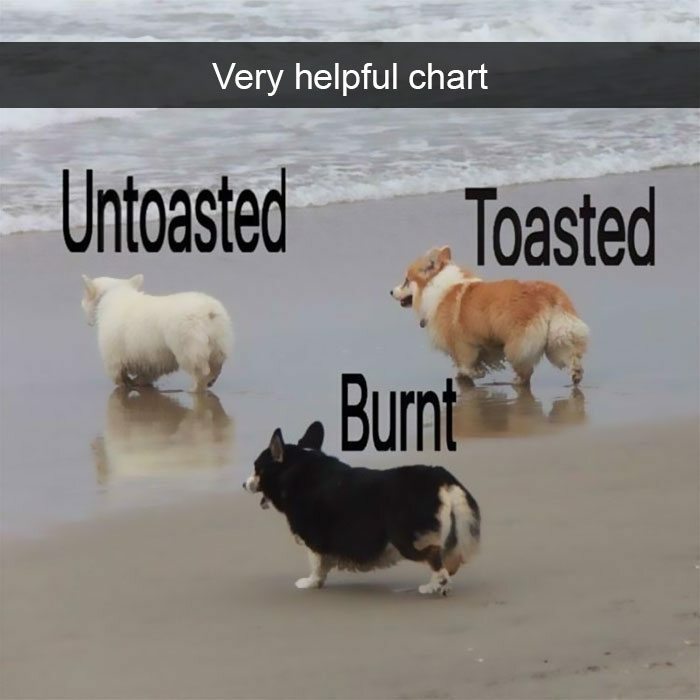 We also love the Snapchat user’s hilarious chart comparing the pups to toast. What a clever idea! 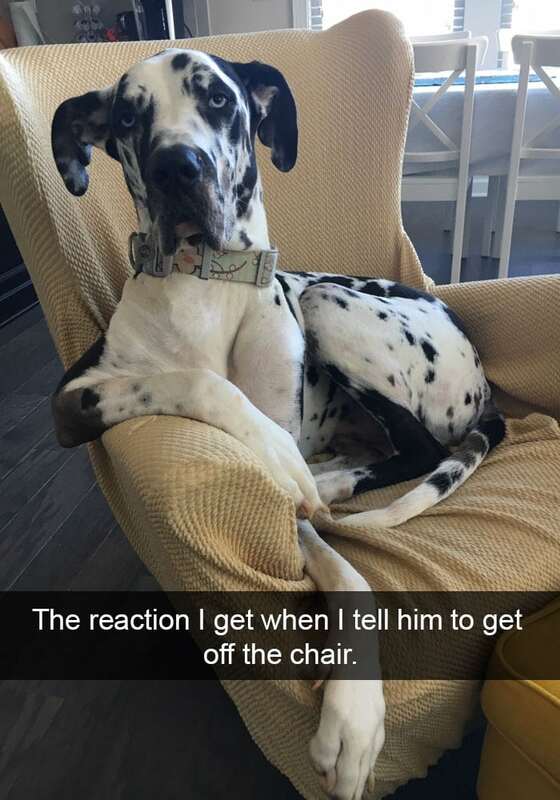 This Great Dane thinks it’s hilarious that his owner would ask him to get off his chair. After all, just look how perfectly the dog fits onto the seat. It seems like it’s made for him! This camping dog enjoyed playing outside, but once it got too cold, all he wanted was a nice place to warm up. 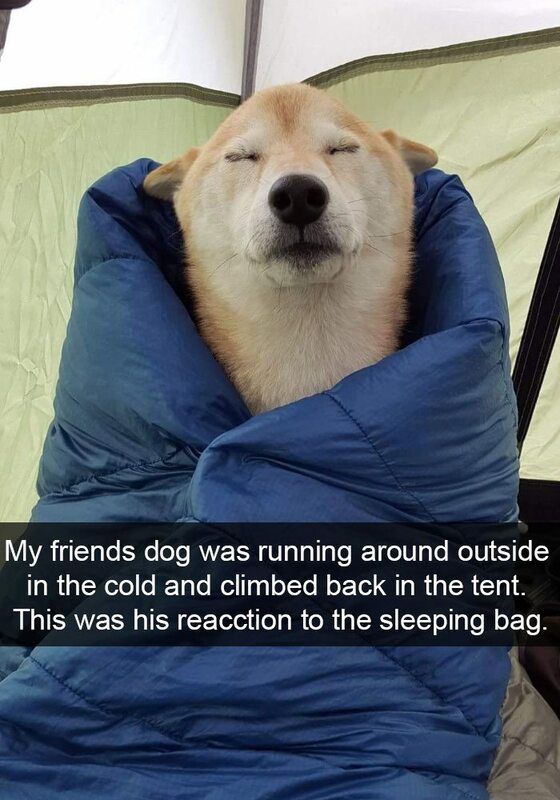 This pup’s face shows his pure bliss at being wrapped up in a cozy sleeping bag. We’re sure he’s going to sleep very well. 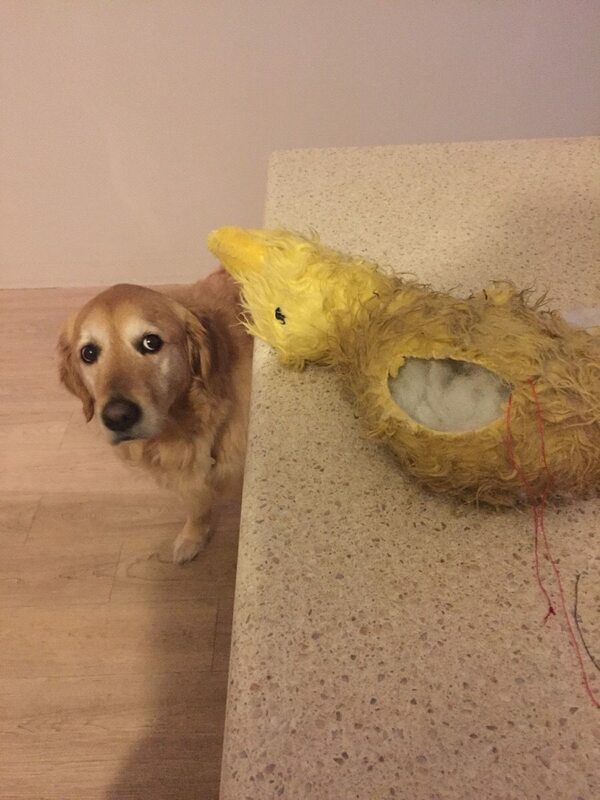 When this dog’s favorite toy got ripped, his owner began doing delicate surgery to fix the toy up. The dog wouldn’t leave the duck until he knew it was okay. Thankfully, the surgery was a success, and the toy duck is back where it belongs by the dog’s side! 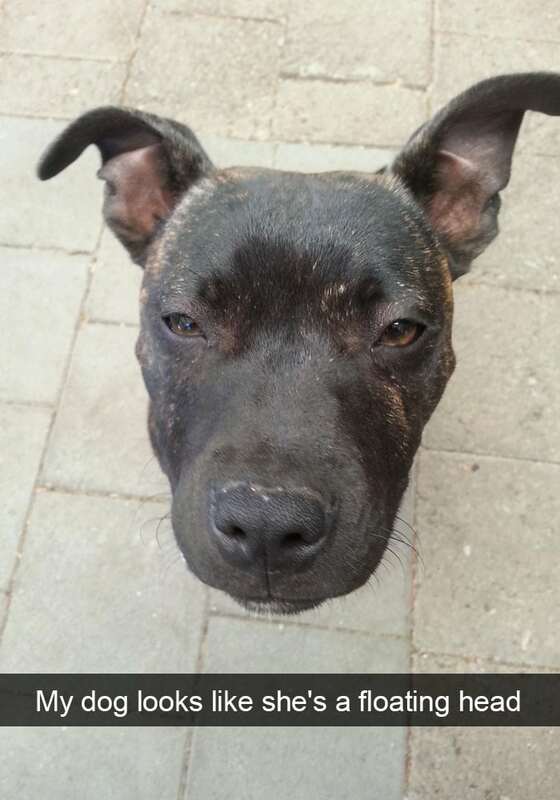 This photo will make you do a double-take—it really looks like the pit bull’s head is floating above the ground! The photographer who took this picture definitely has tons of creativity. 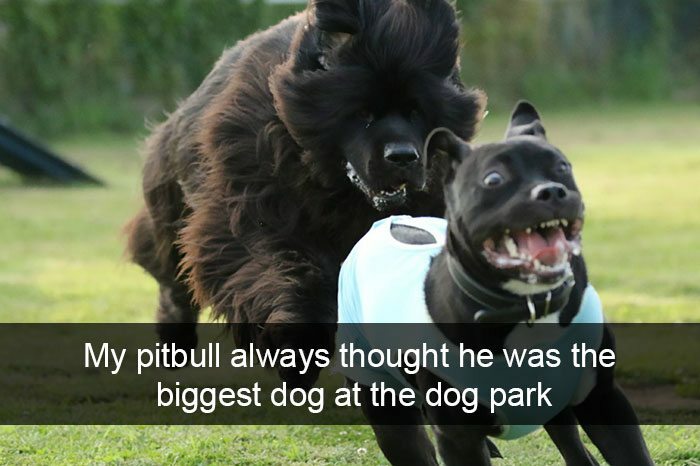 When this pit bull met a Newfoundland dog at the dog park, he was shocked to see how big the pup was. He tried to show the new dog who was boss, but when the Newfie started chasing him, he abandoned his tough guy act instantly! 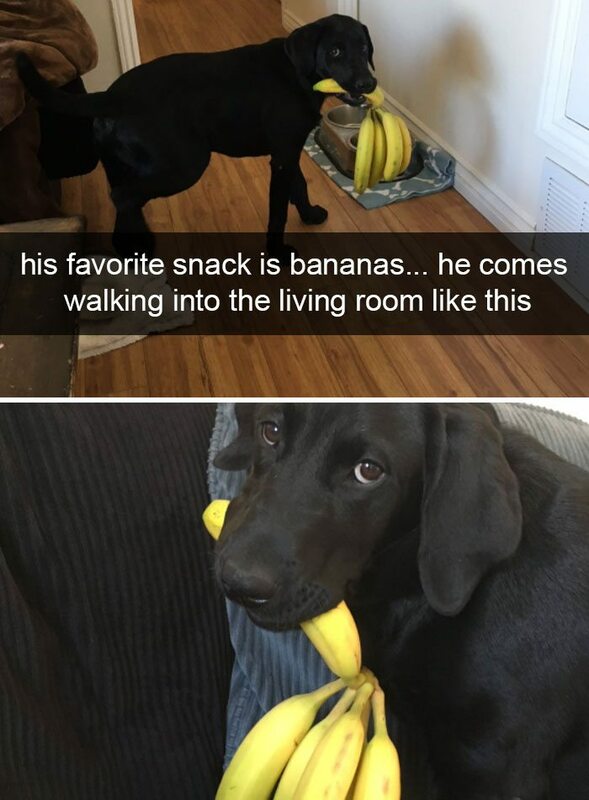 This Labrador Retriever loves bananas more than anything in the world, but since he doesn’t have opposable thumbs, he always needs help eating his favorite treat. Luckily, his human is more than happy to help her puppy out. 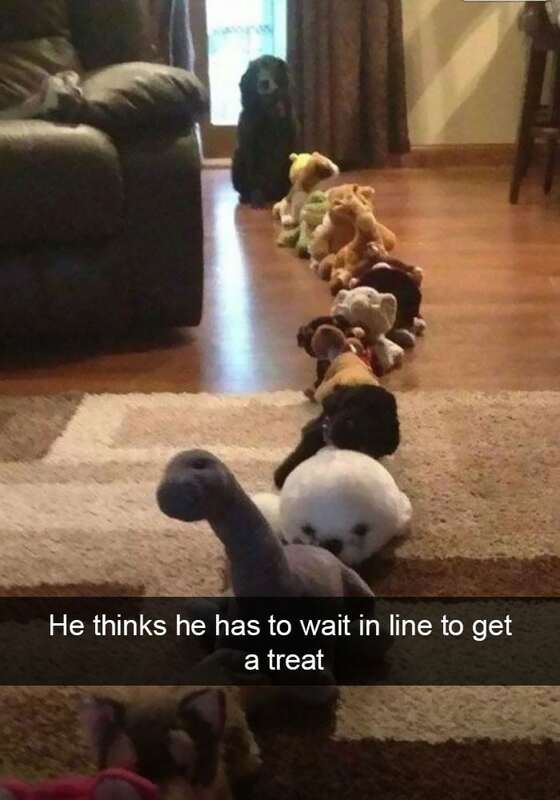 This pup is excited to receive his treat, but in order to get the snack, he feels like he has to be polite and wait in line. Look at him… he heads to the very end of the line and patiently waits until he reaches the front. This dog has far better manners than many humans. Some of us know there are people out there that might just cut to the very front of the line, but not this dog. This dog was trained well and is extremely polite. Now, we just need to have his owner quickly process the customers in front. I wonder how long that will take! 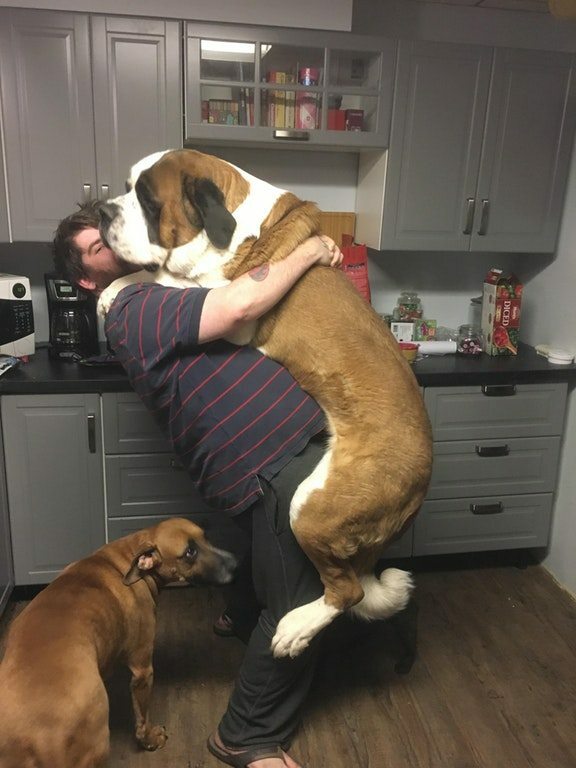 This pup named Heisenberg is almost as big as his 6’1” owner, and he loves hugs more than anything else in the world! Heisenberg’s loving, caring owner gives his dog as many hugs as he wants. He also makes sure to give his other, smaller dog plenty of hugs. Looking at this photo, a few key questions come to mind. First off, just how big was Heisenberg as a puppy? I can’t imagine he was little at all because it seems crazy to imagine a dog growing to THIS big of a size from a small, tiny puppy. Second, how is the owner so strong?! If Heisenberg were to jump on me, he’d surely tackle me to the ground. I highly doubt I could even carry him at all! Finally, I feel for the smaller dog waiting on the side. Heisenberg’s owner surely can’t show love to two dogs simultaneously while holding Heisenberg. I guess he’ll have to wait his turn! Eve is a very talented pit bull who has amazing balance. 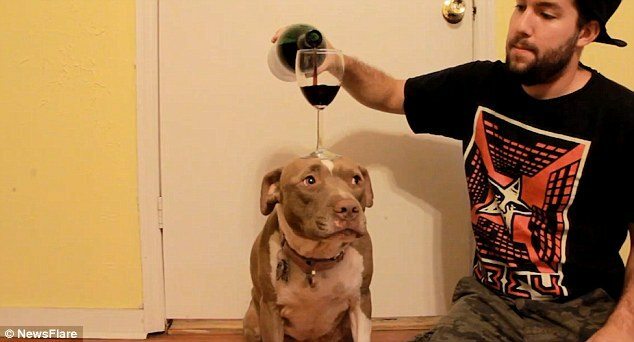 Eve’s balance is so good, her owner can pour a glass of wine on her head without worrying about it spilling. Eve is definitely one adorable wine holder! I just can’t imagine how long it took Eve’s owner to train her to do this trick. I know most of us start with placing a dog treat on top of our dog’s head, but to place a glass of wine? That’s absurd! My dog would never have the patience for this, and I doubt many other dogs would. That makes Eve one truy special dog. 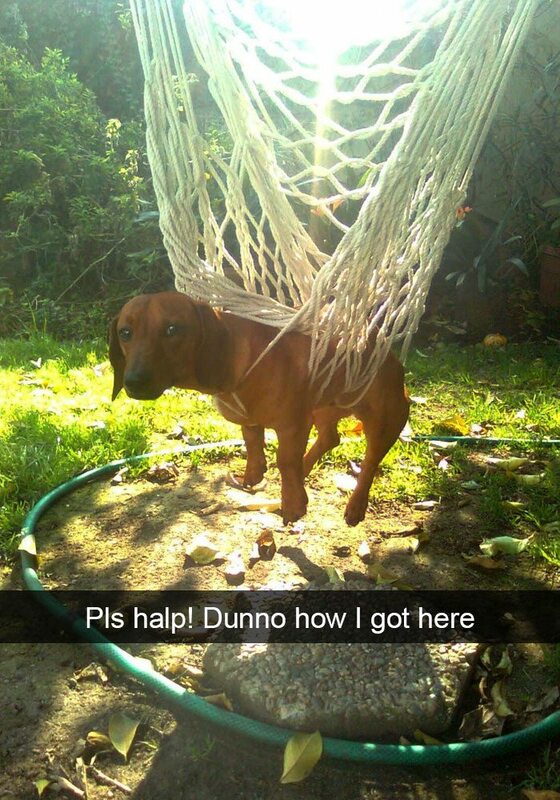 This curious little dog wanted to try out the hammock in his yard, but he ended up getting a bit tangled. The dog looks a bit confused about what happened, but thankfully, his human was nearby and able to help him get out of this mess. 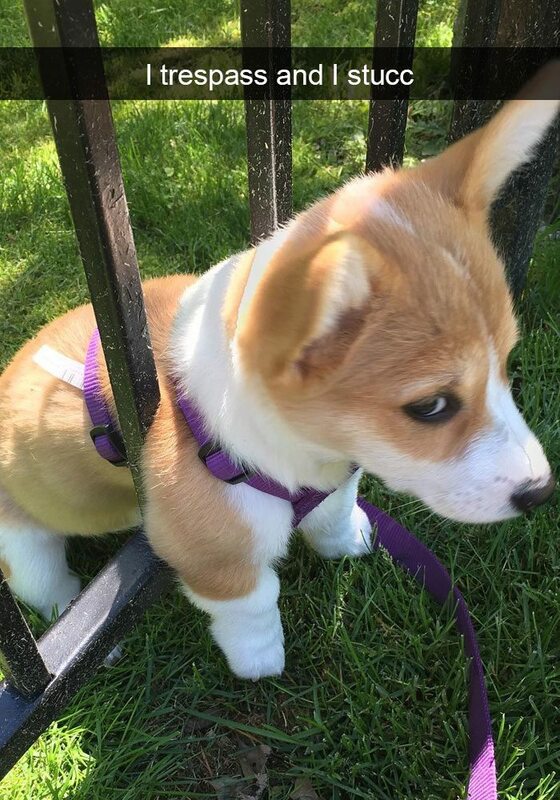 Isabel decided to try and see if she could fit through this fence, but she was just a bit too big. Now, she needs a little help getting back out. 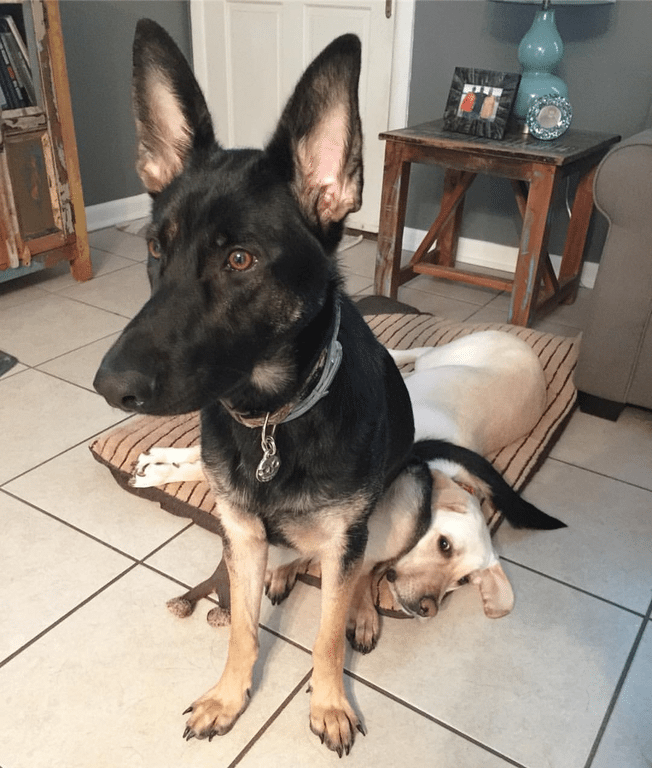 After her human finished laughing and taking a photo, she helped her little pup out of this predicament. This little dog is so happy that she gets to go on an adventure. She’s excitedly waiting to see where her owner will take her and what they’ll do together. We hope she has a great time on her adventure!